Making a good reflective web 2.0 icon takes a lot, if you are a newbie. Previously I wrote about how to make 3D Web 2.0 Icon for your site with ease, but this step by step guide was for those, you have photo-shop installed and know bit of its functionality. Here is good news, you can do the same thing without the photoshop and huge number of steps in justÃ‚Â 4 CLICKS. Yeah, will take less thanÃ‚Â 2 minute and onlyÃ‚Â 4 clicks to make a reflective web2.0 icon. Then click on generate button and reflective icon is ready! 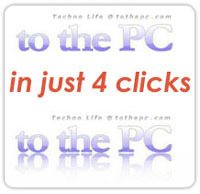 You can right click on the output and then click on copy to transfer image to your computer. You can also click on download button there for the same. Even though I know Photo-shop, I Will prefer to use this service for two reasons: Saves hell lot of time and for that very polish/clean output. I m loving it!